To the skeptics--no need for extra flour, it is really supposed to be that thin! 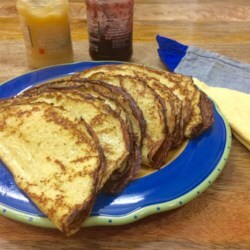 I grew up eating Swedish Pancakes and this recipe is very good. I think the recipe my great-grandmother brought from Sweden was something like: a bunch of eggs, then flour until it's thick, then milk until it's thin. Not being the greatest cook, I need a more detailed recipe to follow. This one definitely works. A helpful hint I learned from watching my mother make them: use a medium sized frying pan, when it's hot, hold it in your hand, pour a small amount of batter into the middle of the pan then use your wrist to turn the pan and swirl the batter around to make an even layer in the pan. You don't need to use much batter--these pancakes are supposed to be very thin.